It's the rainy season in South Sudan. Amy blogs . . .
Photo: Amy Neilson / MSF. The air is hanging heavy with humidity today. The wet season has brought challenges to the retrieval system between our secondary hospital in Agok and our Primary Health Care Centre in Mayom. So today, while the humidity lends me the small nausea reminiscent of my sticky Brisbane childhood, I hope the rain holds off. Three hard-top land cruisers and one truck (pictured below) left this morning, laden with supplies, medicines, a nurse assistant, patients and caretakers. Ever a motley crew including gun-shot patients, one paralysed and recumbent on two mattresses, children recovering from severe malaria, new babies and a slowly recovering multi-drug resistant tuberculosis and HIV patient. All carefully configured. Meeting our convoy en route we expect a new trauma patient, more babies, another nurse assistant, a clinical officer, and international field staff in some combination of two land cruisers and the rather fancy Hagglund. Six vehicles, numerous patients and staff, on bits of ground that are called 'roads' only with all of the persistent optimism of this blessed, messy country. Logistically and medically an important undertaking, requiring mitigation of risk at every turn, I am keen to hear of everyone’s safe arrival. 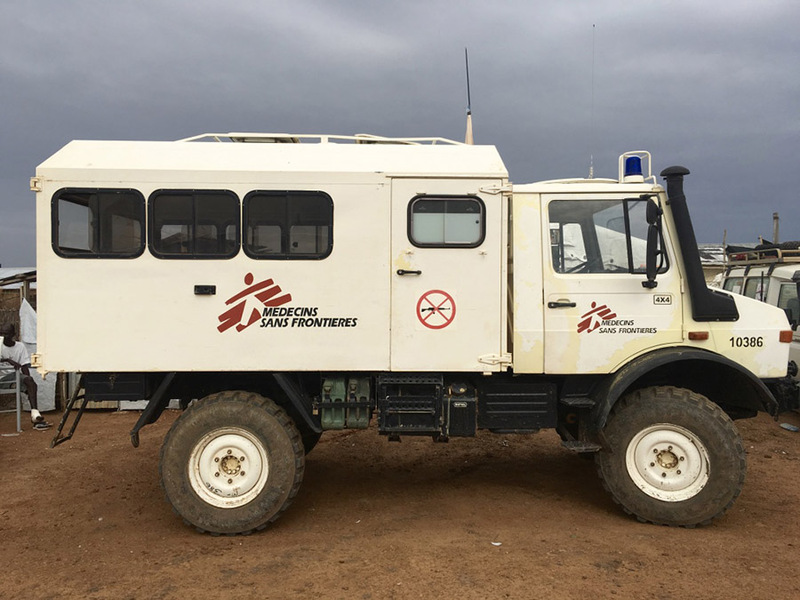 With no ideal solution to medical retrievals in South Sudan, we’ve a collection of vehicles aspiring to meet the varying road conditions. The fanciest – the Hagglund – has come somehow to embody the reflections on the system as a whole – love, frustration, pride, and eye-rolling. Built for snow, not loving the sodden tracks of South Sudan, and prone to breaking down, it is just possible that after a few Tuskers beers it has been jokingly criticised for being a touch useless and pretty. Sceptical eyes narrowed at the painted ‘ambulance’ sign the day we wanted to transport a patient on oxygen but found the back cabin had no electricity port. Blank canvas, opportunity, room for improvement . . . Yet jokes, beer and eye-rolling are ever followed by persistence and solutions. One magical mechanic subdues the Hagglund to his expectations and coaxes it into action. I am keen to send as many patients as I can back today before he takes his week’s leave. Patients and caregivers argue about where to sit in the cars. Anxious to get on the road, the logistician and I redirect people to where they need to be, order them in, and close the doors. Muttering something under my breath about this not being business class, yet equally loving that they bother to growl and quibble. And today, as it happens, the Hagglund wins our sceptical regard, towing the land cruisers out of the spectacularly sticky mud towards Mayom, all parties safely arriving where they needed to be. Onwards and upwards in the development of an exciting and formidable retrieval system. The view from the road. Photo: Amy Neilson / MSF. There was a wonderful quote in the film The Best Exotic Marigold Hotel, when the retired judge expressed his appreciation of India because "all life is here". All life is here. In this most remote, incredibly forsaken place, young men quarrel about car seats. The moment catches me. Floored by the sheer ordinariness, the philosophy of the everyday. This complex web of a hospital, delivering all manner of care with manifest inadequacy – for surely the task can not be surmountable at this juncture – yet reinforcing the right of each individual to health and the reality that robust systems are required to deliver this. My world, a few short square kilometres, comprising all that constitutes any life – the rhythms of food, laughter, a home, sleep, work, friends, love, showers, latrines, and newborn kittens. And the patients and their families, in some fundamental manner, not so different. People spill out of wards and tents, laughing, talking – patients, nurses, caregivers. Children forever want to interact and play, and call out, how are you? They run up and run away. They get to know you better and they stay. The mothers too, come to know us. I pass the Inpatient Therapeutic Feeding Centre (ITFC) at dinnertime. A group of women are gathered around a bowl of lentils between two beds, sharing a communal meal. They proffer the spoon and welcome me to join them, Fadilah. Laughter and tears run throughout in- and outdoor corridors as easily as anywhere else. People hurt and heal. Families get exasperated and want to leave. Some don’t like the food. Shoes are inadequate and broken. Women weave beautiful patterns into each other’s hair. They laugh at me as I pass, indicating my currently short, utilitarian hairstyle with which they cannot work. A small, orphaned girl who lives at the hospital from time to time greets me as I pass the surgical patients on mats outside the tents seeking relief from the heat. A conglomeration of all ages with bandaged burns and grafts, abdominal wounds, external fixations, smiles and sadness. The tuberculosis patients show me their painted green fingernails from the bottle I left there. We laugh, take photos and trade more earrings. Life as it purely is. Henri Lefebvre said, Man must be ‘everyday’, or he will not be at all. He criticised the existentialists for liking humans for what they mean rather than what they intrinsically are. Looking upon my small Agok world, I notice I am surrounded not by ‘inner life’, but by ‘life’. Not a reductionist life, but a frank and real one. Lingering here, in our funny hospital at the edge of the world is an explanation of life as it purely is, holding metaphysical tensions effortlessly. All the realities, emotions and needs of life palmed in the ordinariness of the everyday. The perfect importance of each moment to each person. In the early weeks of my time here, we had a series of deaths of small babies – perhaps, on average, every second night, for a brief, gut-wrenching period. I was struck by the reactions of the team members, the families, the staff on the wards; watching and weighing, trying to understand how each player was seeing this experience around them. 1. International, educated nurses and doctors come to Africa expecting to see malnourished babies die. Yes, it is manifestly upsetting, and an enormous amount of work goes into preventing this very outcome. But this is not about the effort; it is about the perception. It is to consider that to an extent these events occur in the setting of an expectation that prepares international workers. The same international workers who grew up seeing the Ethiopian famine telecast in the 1980s. The same who watched countless Syrians drown or be bombed on news channels these past five years. To arrive privileged is to, in some way at least, arrive prepared. 2. Nineteen-year-old, uneducated, South Sudanese women bring their sick babies to the hospital with another toddler or two in tow, expecting their malnourished baby will live. For this small time, when the mortality rate rose, I watched the mothers in the other beds of our 11-bed Close Monitoring Unit (CMU) watch the others. The rips that found me were for the fear in their eyes. The babies had pneumonias of some origin, and our cardiopulmonary resuscitation attempts without adequate ventilation were never going to be successful. Opinions were divided between whether it was preferable to be seen to be working hard to resuscitate, or indeed reinforcing trauma. This, I don’t know, but I do remember clearly what it was to watch women watch other women watch their babies die. Paul Farmer has been quoted, if access to health care is considered a human right, who is considered human enough to have that right? What is another baby dying in a famine and a war to you? What is it to me? In our indulgent, privileged, inner-reflective life, do we allow ourselves to be bourgeois enough to expect that this mother perhaps should have expected less from her world? I’ve a long-held soft spot for Camus, Sartre and the flamboyance of surrealism and absurdism. I can flail a glass of Veuve Cliquot and pontificate with the best of them. And indeed this is no retreat from the depths of the existentialist’s understanding of inner life. Yet for weeks I have reflected upon a friend and colleague who sees simplicity where I see complexity. And today, I am with him. And with Lefebvre: struck by what humans in their ordinariness intrinsically are as they exist in the everyday, the space in which all life indeed occurs. My TB patients compare their green-painted nails to my blue ones, and the nurses in the ITFC laugh at the photos I’ve taken and printed out for them. The cook presents me with the earrings she bought at the market for me to give the patients, as I never find the time to shop. The epidemiologist tries to wean the squeaky new kittens from their attachment to her as the end of her assignment here looms. Radios crackle. The truly terrible Nigerian soap operas play in dubbed English from the box television. Colleagues tease, play, laugh and irritate each other. And I am ever reminded that all life is here. All life is here. It is made of the ordinary and the everyday. It is enough. And it belongs to us all. View of Agok. Photo: Amy Neilson / MSF.